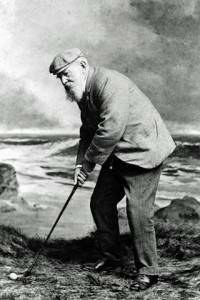 Morris Family (Golfing) – The Fife Post………..for genealogy and historical information. My story begins in St Andrews of 1777 when John Morris a hand loom weaver met and married Grizel Gatherum on the 14th of November; two children soon came along with Janet Morris being christened on 24th Dec. 1780, and John Morris being christened on 19th April 1778. Janet was to stay single and to live to a good age and dying in 1875 a very sad year for the Morris family. John was to marry Jean Bruce on 1st Nov. 1806, and they had a fine brood of children included amongst them Thomas Morris (later to be known as Old Tom Morris).Their family were Helen c 30th August 1807, Janet c 16th July 1809, John c 26th May 1811, James c 6th June 1813, Margaret c 14th January 1816, George c 27th June 1819, Thomas b 16th June & c 24th June 1821, Jean c 31st August 1823. All the children were christened in St Andrews, Fife. Thomas Mitchell Morris was born on the 16th June 1821 in St Andrews, Fife; he was christened on the 24th June by Dr Buist, witnessed by John and William Morris. 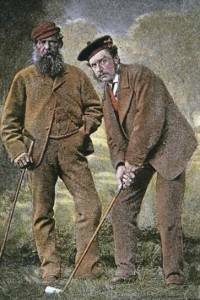 Old Tom grew up in time when golf was the preserve of the affluent due to the cost of hand crafted wooded clubs and “featherite” balls. Growing up in St Andrews, he would have been surrounded by golf and indeed his first job was apprentice ball maker to Allan Robertson. He met and was married to Agnes Bayne in St Andrews on the 21st June 1844, when he was 23 years of age. They had a son named ThoYoung Tom Morrismas born on 8th January 1846, but very sadly he died in April 1850 aged 4 years. 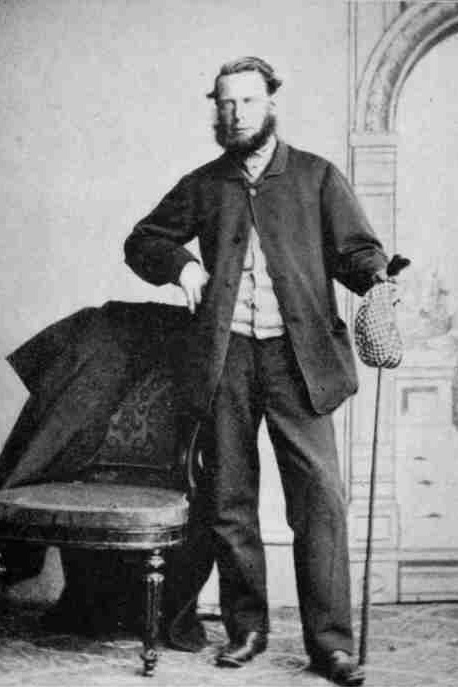 Distressed by his son’s death, Tom was offered a job in 1851 at Prestwick Golf Club as the Green keeper and accepted. 1851 was to become a good year for Tom, a new job. A new son born on 20th April 1851, he was to be christened on 10th May in St Andrews, and named Thomas. (Later to become known as Young Tommy Morris) Their children were Thomas b 8th Jan 1846 St Andrews, Tommy b 20th April 1851 Monkton, Ayrshire, Elizabeth b 1852 Prestwick, Ayrshire, James Ogilvie Fairlie b 8th Jan 1856 Monkton, Ayrshire, John b 25th Set 1859 Monkton, Ayrshire. Old Tom helped to set up the first Open Golf Championship in 1860, and he finished second to Willie Park. He won the 1861, 1862 and 1864 Championships, before he got the job of the Custodian of the Links at St Andrews in 1865; he set up his own club and ball making business. Old Tom won the Open for the fourth time in 1867, and for the last time, (but he continued playing in the event until 1896.) 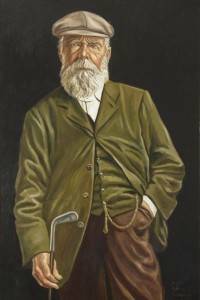 He taught many young men for the next twenty years the craft of playing golf, ball and club manufacturing, green keeping and golf architecture.Old Tom Morris playing golfYoung Tom Morris son of the legendary Old Tom Morris, grew up also with golf all round him, it is certainly known that he competed as a professional from the age of 13. Amateurs were held in higher esteem than professionals t the time, the latter made their way through betting, tuition, caddying and often ball and club making. The Morris family had their own workshop exporting goods all over.Tom Morris Snr and Jnr. In July Old Tom’s aunt who never married, died at the age of 92, and two short months later Young Tom’s wife of one year Margaret Drennan, daughter of Walter Drennan and Helen Donald, took ill during childbirth and died of a ruptured uterus at 3 pm on the 11 September 1875. 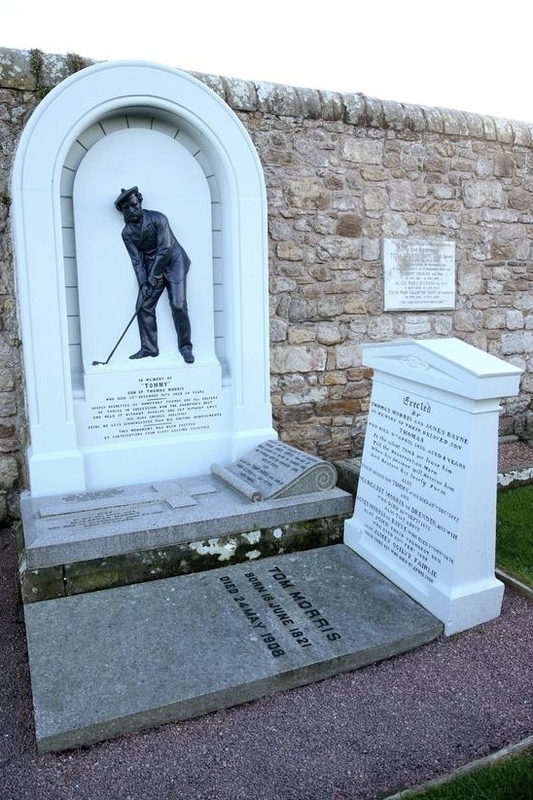 Young Tom was playing golf in North Berwick and attempted to get back to St Andrews to see his wife but was notified by telegram thYoung Tom Morris gravestoneat she had died. Young Tom never really recovered from the shock and he himself died on Christmas Day 1875 from a Pulmonary Haemorrhage at 10am. On 1 November 1876 Old Tom’s wife Agnes died. On 24 September 1878 a large memorial was unveiled on his grave in the Cathedral burying ground, it reads “Deeply regretted by numerous friends and all golfers, he thrice in succession won the Championship Belt and held it without envy, his many amiable qualities being no less acknowledged than his golfing achievements”.Old Tom Morris Never has so much been achieved so young – an outstanding golfer. 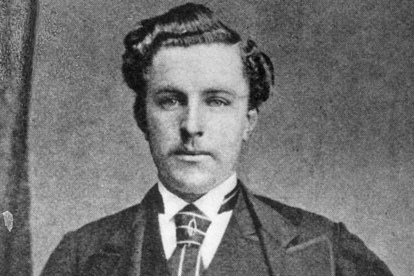 In 1893 saw Old Tom’s youngest son Jack die on 22 February. 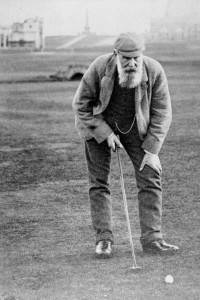 1898 Elizabeth Hunter (nee Morris) dies 1906 Jamie Morris who himself was a professional golfer died. 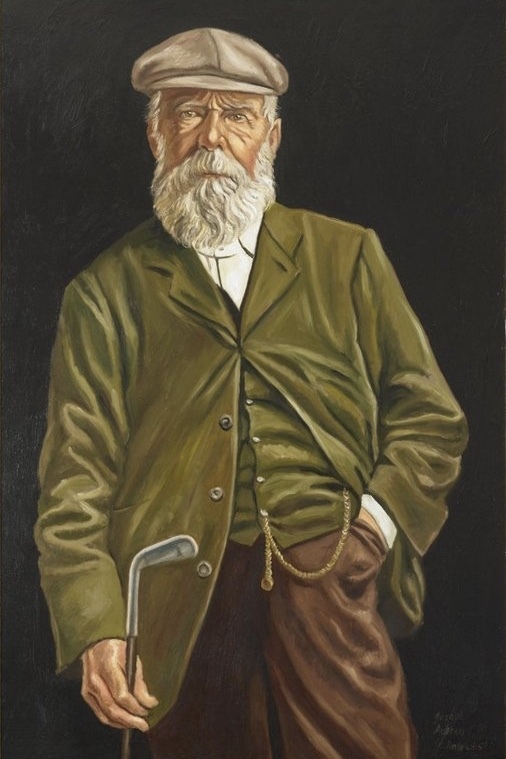 Old Tom Morris, (who outlived all his family) was associated with St Andrews until his death in 1908, it was ultimately his work with golf that was to be his end as well, and he died a few months after receiving injuries, when he fell down the stairs at the clubhouse. His funeral was attended by hundreds of admirers. 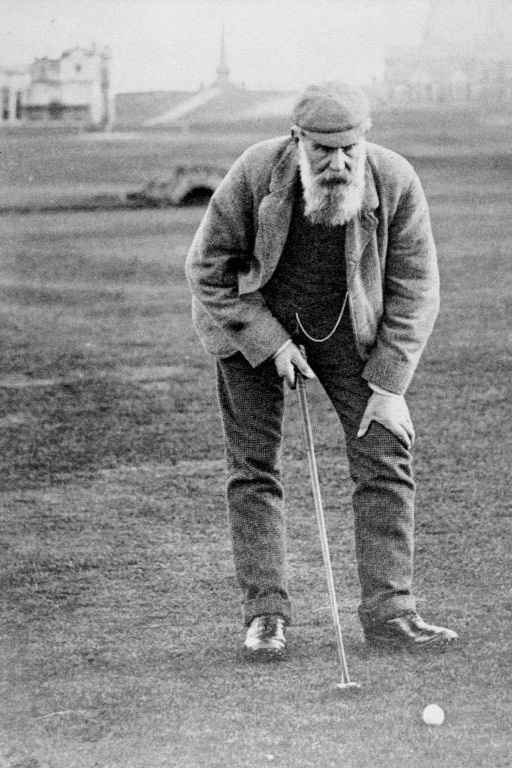 my interest is for the Goeorge (older brother of Old Tom) MORRIS history.